A total of 21% of 14-15 year olds questioned for the Alcohol Concern Cymru Wales-wide survey said they had bought alcohol online. The charity surveyed nearly 1,000 teenagers aged 14-17. Calls for procedures to be toughened have been made but retailers have said they take their responsibilities seriously. The Alcohol Concern Cymru survey found that 15% of all respondents said they had successfully bought alcohol online while 7% had tried to buy alcohol online but were unsuccessful. Mark Leyshon, policy and research officer for Alcohol Concern Cymru, said young people regarded internet shopping as an "easy" way to buy alcohol. "Retailers offering home delivery services need to toughen up their processes to ensure that children and young people are prevented from accessing alcohol through this channel," he said. "Young people have told us that these sites offer less robust age verification practices and provide a quick and easy way to get hold of alcohol, especially for younger teenagers who would likely have greater difficulty in buying alcohol in person from in-store at a supermarket or off-licence." 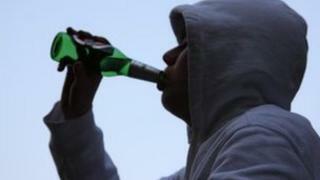 Commenting on the findings, Baroness Finlay of Llandaff, a former president of the independent health education group the Royal Society of Medicine, said: "It's clearly worrying that children and young people in Wales may be able to access alcohol in this way. "Alcohol retailers need to improve their procedures to ensure that alcohol is sold and delivered to adults only." John Munro, director of the Welsh Retail Consortium which represents suppliers, told BBC Radio Wales that members took their responsibility seriously and that staff were given the correct training. He said any instances of a lapse in procedure, although small, should be reported so issues can be addressed by the organisations concerned. "Members take their obligations not to sell to under-age purchasers very seriously," said Mr Munro. "There are robust systems in place for age-restricted products purchased online, and delivery drivers are trained to ask for ID if they have good reason to believe that age is an issue. "However, issues occasionally arise as banks are unwilling to identify people under 18 on credit or debit cards, which would be the easiest way of restricting purchases online. "Parents also have some responsibility for the way in which their own cards are used by their children." Meanwhile, four out of nine under-age test purchasers working with police in Cardiff bought and received alcohol online in March. Scott Lloyd, licensing sergeant with South Wales Police, said he was "disappointed" with the findings of the test purchases operation in Cardiff using 15-year-old buyers.